Own the City! Get the grip you need to navigate the urban jungle safely, comfortably and efficiently. Designed to meet the challenges of city riding on a variety of surfaces, in the wet and in the dry. 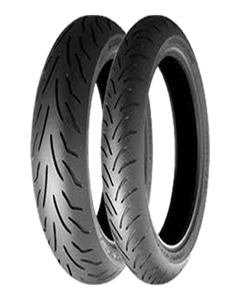 The Battlax B02 and B03 boast a number of OE fitments on a wide range of machines from 50 to 400cc. Feel the difference of high-quality, bias construction delivering excellent handling characteristics and good mileage. Bridgestone’s dedication to safety is your guarantee of lasting quality and reliability, whatever the road throws your way. Reduced pattern noise on the front and rear tyre ensures a really efficient and above all comfortable ride on a variety of surfaces.